Free food – I love it! Both these plants have come back for at least 4 years. I just whack them down, dunk in a bucket of cold water, rinse and spin in the salad spinner. Then lay out on paper towels in baskets and forget about them! In a few weeks they are crispy. Then it’s time to shove them into tins. The oregano gets massaged to drop leaf parts into tomato sauce, pizzas, salads, eggs, you name it. 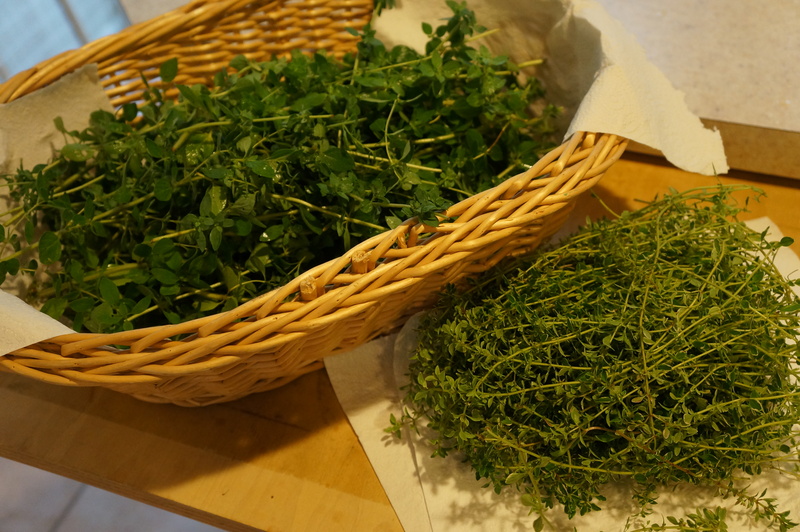 Same with the lemon thyme, which is a favorite on eggs. It doesn’t get any easier than this! These plants are completely neglected by me and the bugs in the garden. Their high essential oil content protects them and me when I eat them!